Thanks to a particularly nasty encounter with a flu bug I’ve been under the weather and very limited in creative energy. In fact, for a number of days, I existed on fluids and slept. Now hubby is dealing with it. 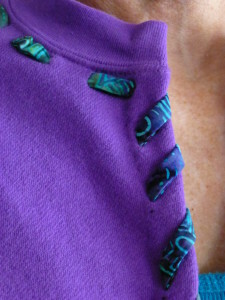 However, a bit of hand work did manage to get completed and here is the first of my up-cycled sweatshirts finished. Complete with pockets, it is sure to become a favorite! As the instructions I worked from didn’t have images, I assumed that the folded fabric lacing would be ‘whipped’ around the folded edge of the sweatshirt. However, straight lacing around the back of the neckline and the sleeves demonstrated that it could be equally appealing ‘straight’ stitched. It was a struggle to get the folded fabric through the holes created by the awl. Using the awl, fewer threads were broken and should have less impact on the long-term durability of the sweater than cutting the fabric as suggested in the guidelines for my second project (next post). I removed the lower ribbing but left the ribbing at neckline and sleeves. I knew from experience that this was my preference but I could have removed both. All in all, I feel it was a success. Love your Sweat shirt jacket !! I’m seriously considering making me one. I hope I can do this. It is such a great idea. Hmmm…instead of using an awl, wonder how making buttonholes to weave the bias through?? Like your jacket…think it is lovely! Could do that but not necessary. My sweater has been machine washed many times without mishap. The holes eventually take the shape of the binding and button holes would be much more obvious. What’s the best place to buy patterns for making the different sweat-shirt jackets ? There are no patterns. I just make them up as I go! I really like the purple! I’m going to try this. All of your designs are Great! lovely idea but where can I find the instructions. This jacket was easy. 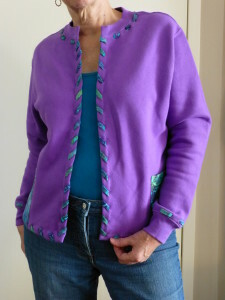 I like to wear my sweatshirts as jackets so I folded the front, matching and pinning the side seams, then cut along the fold. I then used coordinated cotton fabric to make folded bias binding. After folding back the cut edges of the sweatshirt I made evanly spaced holes wife a sewing awl. I used a Odin to thread the bias through the hole adjusting I to lie flat before proceeding to the next hole. Pockets were made by stitching a folded piece of fabric right sides together and turning it right side out before applying to the sweatshirt.